Coming from Europe, I think week numbers are an awesome way of keeping track of the weeks, but like the metric system it just never caught on here in the US, regardless of how much sense it makes. So even though week numbers are the better option, like column/bar charts over funnel charts, let’s have a look at how we can work with the date formatting on labels. First up, MS Dynamics CRM does not support changing the date labels on an axis. If you change the xml for the labels, the chart will either just show you the standard date formatting, or the chart will show a render error, even though the xml is correct. 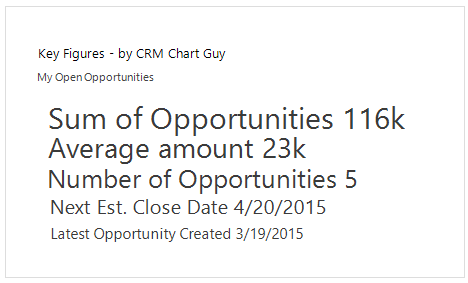 For this reason, I’ve previously stated that this requirement cannot be met with charts in Dynamics CRM. However, unlike the axis, you can actually format the dates on the label for the series. 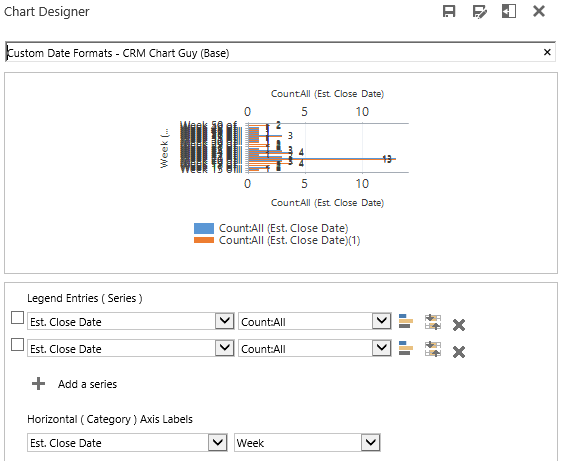 So to address the question on changing the week numbers on the axis label, I will try and remove those labels and use a series label instead to show the date in the desired format. It is not perfect, so if you can live with the drawbacks I mention throughout this post, it will probably work for you. Let’s create the foundation. In the chart editor, we will need two series, and of course, the week we are grouping by. We need two series. One to show the actual count of opportunities, and one to hold the label for the custom date formatting. Open the chart xml in Notepad ++ and get ready to make some changes. In the CRM chart xml below, I have updated all the auto generated aliases to something more meaningful in this context. In the xml, my changes and additions are in green. Besides updating the aliases, I made one significant change in this section. In the attribute for the “dateformat,” I changed the aggregate to “min” for minimum. Also note that I have the “dateformat” before the “countofopportunities” in the category collection. This way the count, which is the number we want, is drawn last and on top. Before you import, scroll down on your chart xml and make this VERY IMPORTANT change. 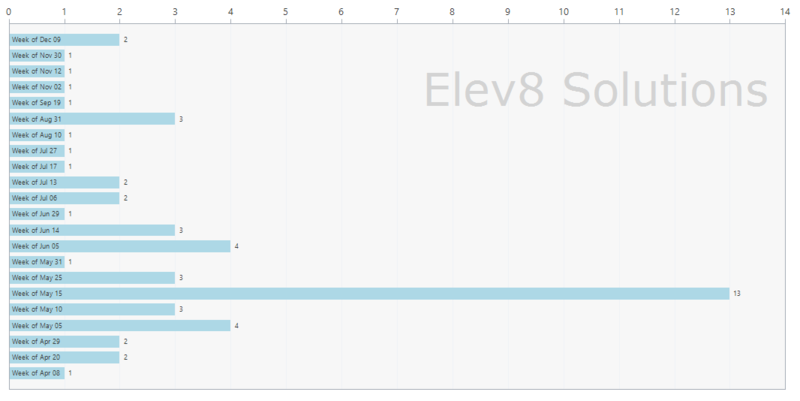 In LabelStyle for the first Y axis, add Format=”CRM Chart Guy” as above. If you do not add this format you will get a rendering error. 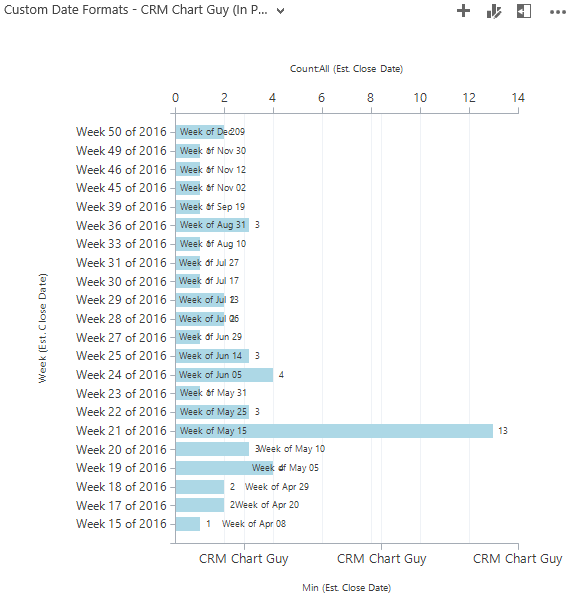 This seems to be a bug in how Dynamics CRM renders charts, but this is the way to get around it. Now you can import the chart and make sure everything is still working. So far, so good. You should now be able to see that one of the bars contains the date, while the other still has the count. As you have probably figured out by now, the date that we are going to get may not be the Monday of that given week. It will be the earliest date of that week, where data was present. So use with care as it could be misleading if your first date happens to be the Friday of a given week. However, for daily events, it should be fairly accurate, or at least close enough. The LabelFormat=”‘Week of’ MMM dd” is what gave the label the “Week of Aug 29” label, or whichever date was the lowest for that group. “ddd” = Abbreviated name of the day; Mon, Tue, Wed etc. “MMM” = Abbreviated name of month, i.e. Jan, Feb, Mar etc. Pay attention to the case of the letters. “m” is for minutes, while “M” is for months. The full set of options can be found on MSDN here. As in this post, you can combine the options like “dd MMM yy” for “31 Aug 16”. Also, when adding leading text like ‘Week of’, put it in single quotes to avoid some letters being displayed as a value instead. Ok, let’s fix those axes and the labels that just say CRM Chart Guy. This is actually really simple. I just deactivated them by adding Enabled=”False” to both AxisY and AxisX. Now, I did a little more than that. Right before the AxisY, I made a few modifications to the ChartArea. Import and your result should look a little like this. Notice there may be some conflicts between the date label and the actual value, when the value is low. That can be alleviated by either simply removing the value, it will still appear in the hover text, or giving the chart some more horizontal space if it is on dashboard. The context where I usually use custom date formatting is on Key Figures Charts. Using the custom date formatting, I can write the dates in whatever format desired and can even leave out irrelevant pieces. Finally, add this section right before the </Chart> closing tag. Looks great! You can read more about Elev8 Solutions and our innovative immersive approach to CRM projects here. Which also happens to be where I work. I really appreciate our willingness to help even without getting much in return. 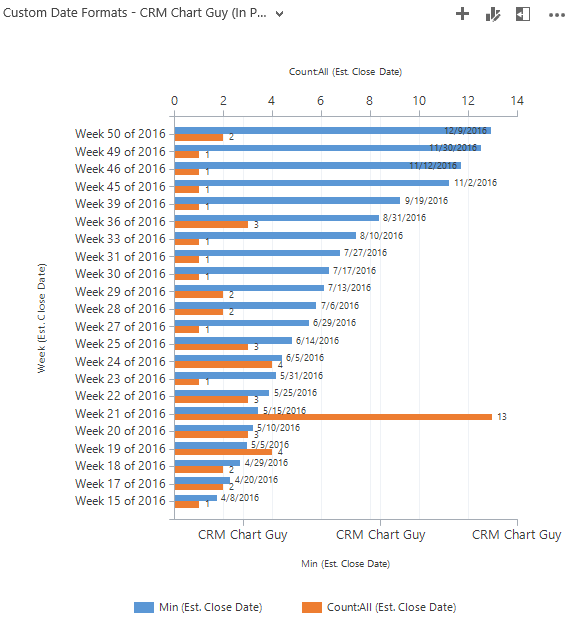 Hopefully knowing that you’re the man when it comes to CRM charting will suffice! This one directly answers one of my users’ biggest complaints. I agree and tried to argue that it’s better to refer to the weeks by their relative number in the year but how do you change a culture. Anyway, I appreciate the help very much! Thanks for the comments Seth. And thanks for asking the question on my blog too. I do use it as inspiration for what to write next when possible. I’ve built this chart and it’s awesome, so thank you for the steps! One thing I’ve noticed though is that sometimes the label on the top bar isn’t left-aligned with the others. Instead it’s centered. Any way I can fix this to force it to stay on the left? I have same issue. Did you ever resolve? Format=” ‘Week of’ MMM dd” . However, it is not updating the format. Nevermind. I missed the part that you can’t format axis. No problem. Glad you found it. So, can you do this with multiple measures? I am trying, but it doesn’t seem to be working. 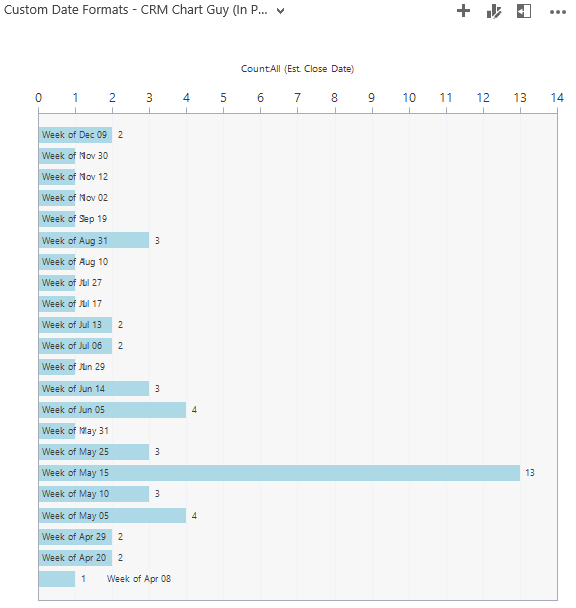 I have a chart showing count of Open, Blocked and Completed by Week. So, I thought if I put the date format in front of each one, it may work? No luck so far. I really appreciate all you do. I do have a question on regards to this chart. How would I be able to add the missing weeks to show “0” if no activity was logged. ie in your example Week 16; week 24 etc. I am trying to create a chart to show activity by month but need to also show if no activity was recorded in the month Is this even possible? Hi – Just wanted to clarify that it is still the case that we cannot edit the actual axis to show something like “Week of Aug. 20” instead of “Week 34 of 2017”, correct? Is your “Regarding” field on activities set correctly? Include records with no value in charts!! !